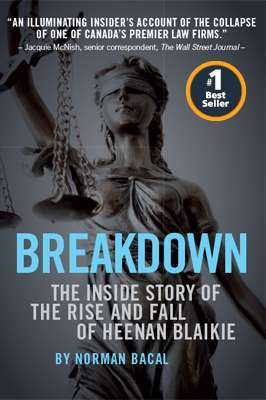 Norman Bacal’s new book, Breakdown: The Rise and Fall of Heenan Blaikie, has hit The Globe and Mail's bestseller list! Congratulations to Norm for writing a compelling book about the sudden collapse of the law firm he led until a year before its collapse. It’s a cautionary tale for anyone in business who neglects the importance of vision and culture to bind people together. Bacal’s book has been a winner from the day it was released at the end of February. It’s been a bestseller on amazon, and at Ben McNally’s much-loved bookstore in downtown Toronto. Breakdown has also sold out at several Indigo stores in Montreal and Toronto. Books are selling in stores, including Paragraphe in Montreal, largely because of the terrific sales team led by Rob Dawson at Georgetown Publications, which handles sales and distribution for Barlow across Canada. Congratulations to the Barlow team led by managing editor Tracy Bordian for producing a superb book, and to designer Paul Hodgson for creating a cover that truly reflected the compelling story inside.